A super boy fighting against ASD & T21: Happy Birthday! Today is my birthday. Instead feeling older, I feel younger, he, he, he. I feel in my soul and my heart a great peace and rewarding feeling because I am a successful woman. Because over the pass two years, I have learned to balance my carrier, motherhood and wife role in a very busy schedule to provide all the stimulation my son needs, which includes the EIP therapies and private pay therapies. It hasn't been that easy, but I finally feel I have learned to handle it. I am a super woman, he, he, he. The great feeling every time our therapists give me a call, leave a note or talk to me about how great Tommy is doing is priceless. The best gift I could receive today is a call from his DT to say Tommy did absolutely great, he did everything she was teaching him and he even said a new word this morning while they were looking at a book. He said "APPLE" multiple times. Tommy has given me the best birthday gift. God chose me to see the wonders he can do through my son. Raising my child with T21 is priceless. May you always soar high above the clouds! 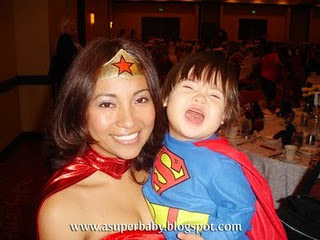 Rosa, you ARE a super mom. It is amazing the things that you have done since you have made the United States your home. And Tommy is a real cutie-pie.